When an Evil Wizard makes off with Princess Liliana, only Tom Driftwood has the fortitude, courage, and mental dexterity to rescue her. Also, he was the only one to volunteer. 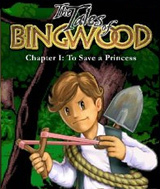 Help Tom escape from the village of Bingwood in the first leg of this epic retro adventure game. Comments: I did not like this game at all. Your this boy that went on this adventure with terrible graphics an no concept. When you try to use the item you find ther was no way to do so. This game maybe great for others but not for me. Comments: I really loved this game!! Classic RPG fun. Great music and storyline. At first I thought I would just play for the required 30 minutes but it was so much fun I played until the end! You have to go through the town completing tasks and gathering items to get across the bridge to the shady forest to rescue the princess. I can't wait until Chapter 2 comes out! I recommend this to any RPG fans who aren't looking for a blood and guts type of game.